If you’re interested in learning more about how the Low FODMAP Diet works it’s important to understand how FODMAPs are made. 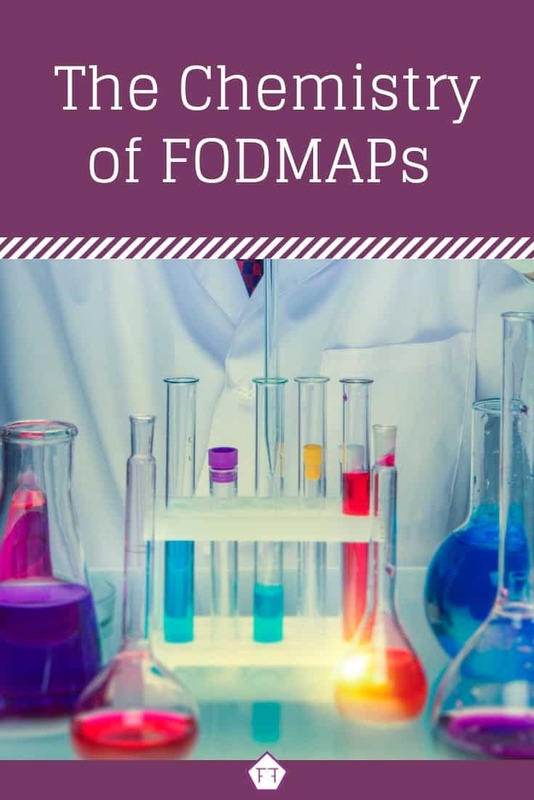 In this article, we’ll discuss the basic chemistry of FODMAPs and the part they play in the low FODMAP Diet. Grab yourself a FODMAP friendly snack, because we’re going to start from the beginning. The easiest way to start talking about FODMAP molecules is to start with the building blocks that make them. Atoms are the smallest stable units of matter. They are made of three basic parts (protons, neutrons, and electrons). For our purposes, all you need to know is that protons (p+) carry a positive charge, neutrons (n) carry a neutral charge, and electrons (e–) are negatively charged. Stick that on a post-it, it’ll come in handy later. Protons and neutrons use the buddy system. This means they appear in pairs and stick together. They’re found in the “nucleus” which is at the center of an atom. 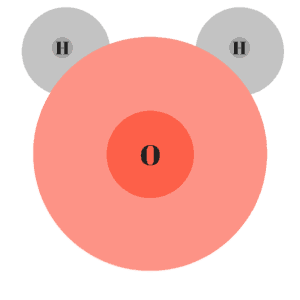 The number of protons in the nucleus is used to determine the “atomic number” of an atom. While it’s still not clear exactly what happens, scientists now think electrons don’t follow a specific route. Instead, they hang out in “orbitals.” Each orbital contains two electrons which live in a specific space around the nucleus. These orbitals form an “electron cloud” in which electrons travel less like cars on a track and more like my dogs chasing phantom squirrels in our backyard. They’re confined to a specific space, but it’s nearly impossible to predict their movements. I’ll still use the shell model in this overview because it’s easier to follow. Atoms as a whole are electrically neutral by nature. So, for every positive proton/neutron pair, there should also be a negatively charged electron. 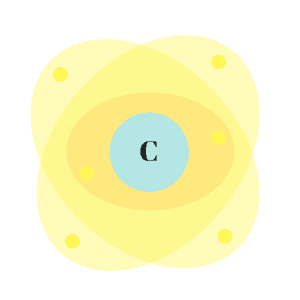 This means in addition to showing the number of protons inside the nucleus, the atomic number also represents the number of electrons around the nucleus. Now that you understand the basics of atoms, let’s talk about how they transition from independent building blocks into FODMAPs. A molecule is formed when two or more atoms combine to make a more complicated structure. There are lots of ways atoms can commingle, but the most common reason is the quest for a complete set of electrons. There is a theory, called the octet rule (the rule of eight), that suggests all atoms are on a mission for a complete outer shell. With the exception of hydrogen and helium, an atom needs eight electrons to complete its outer shell. We’ll call it a valence shell for clarity’s sake and because old habits die-hard! Atoms complete their valence shells by sharing or stealing the electrons of other atoms or molecules. There are three ways this can happen: 1) a nonpolar covalent bond; 2) a polar covalent bond; or 3) an ionic bond. Whether an atom gains or loses an electron is based on its “electronegativity” (how much it wants the electron). To determine how much force it takes to pull an electron from its original atom we use Coulomb’s law. Opposites attract? That was him. Coulomb’s law is technically from physics, but it’s used in chemistry to explain why protons and electrons stay in place. Coulomb believed because protons and electrons are oppositely charged, they would be attracted to one another; while like charges would be repulsed. He also believed the higher the atomic number and the closer the electrons were to the nucleus, the stronger the force would be. This means atoms like carbon, with only a few shells, will have a stronger pull than atoms like calcium, which have lots of shells. What you need to know, is that atoms with a higher atomic number (with many protons to pull on other atoms’ electrons) and fewer shells will have a higher level of electronegativity. A nonpolar covalent bond is when two atoms have the same electronegativity and share an electron equally between them. 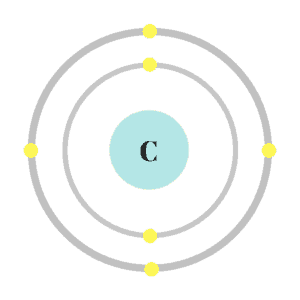 If one electron is shared, it’s called a “single covalent bond,” if two electrons are shared, it’s a “double covalent bond,” etc. Think of it as a game of catch. The ball goes back and forth between us as we take turns catching and throwing. In a nonpolar molecule, every electron being shared is a ball being passed back and forth between each player (atom). Because the electron is shared equally, the charge of each atom remains neutral. Fats and oils are an example of nonpolar bonds. Some covalent bonds are unequal. This means one atom has a stronger pull on the electron than its partner. So, this atom will have the electron more often. Think of this as a game of tug of war. The electron is still shared between each atom, but it is pulled off-center by the stronger team. Because an atom naturally has equal numbers of protons and electrons, the atom with the stronger pull takes on a negative charge (because it almost has the electron). The weaker atom will take on a positive charge (because it has almost lost an electron). Water (H2O) is a good example of a polar molecule. In water, the oxygen atom (which has 8 protons), has a stronger pull than the hydrogen atoms (which have 1 proton). The pull is so strong, the electron clouds of the hydrogen atoms become distorted. Because the oxygen atom is hogging an electron from each hydrogen atom, it will take on a negative charge. The opposite happens to the hydrogen atoms which will each take on a positive charge. Polar and nonpolar molecules repel one another – think oil and water. Since FODMAPs are polar molecules, their flavour can be infused into nonpolar fats (like oil and butter) without leaching FODMAP molecules into your food. More on that later. Ionic bonds are something different entirely. In an ionic bond, atoms are paired together by electrical attraction rather than a chemical bond. In these cases, an electron is stolen from one atom and added permanently to another atom’s valence shell. Think of this like a meet cute in any 90’s teen movie. The leading lady is taking an exam and realizes she’s forgotten her number two pencil. Her co-star swoops in and hands her a spare. The pencil is the catalyst that bonds them together, but it normally isn’t returned. While on a quest to fill their valence shells, atoms have to be economical. For some atoms, it’s easier to give up their electrons and move to a lower (complete) shell than to collect 5, 6, or 7 additional electrons. FODMAPs fall under the umbrella of organic chemistry. This involves molecules unique to living organisms and can include: carbohydrates, proteins, lipids (fats), and nucleic acid. The common thread through all “organic compounds” are carbon and hydrogen. Oxygen is another common element, but it isn’t mandatory. Carbon is special because it is “electroneutral.” This means it doesn’t gain or lose electrons; it always shares. Additionally, because carbon has 4 electrons in its valence shell, it can form 4 bonds. This makes it easy for carbon to form long chains and rings (common in carbohydrates and steroids). Carbon atoms are also ideal for forming branched compounds (common in lipids). Carbohydrates are organic compounds containing carbon, hydrogen, and oxygen. Carbohydrates are soluble in water. Though, the larger the carbohydrate compound, the longer it takes to break down. This is important information, as it impacts how easily carbohydrates are digested. Carbohydrates are also an important source of energy for the body. Their superpower is that they’re used by the body immediately instead of being converted to glycogen or fat to be used in the future. There are three types of carbohydrate compounds discussed in the Low FODMAP Diet: monosaccharides, disaccharides, and polysaccharides. I discuss specific FODMAP groups here! 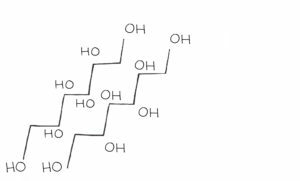 Monosaccharides, sometimes called “simple sugars,” can appear as rings with a carbon skeleton of 3-7 carbon atoms. These are called “trios” (3 carbon), “tetros” (4 carbon), “pentose” (5 carbon), “hexose” (6 carbon), or “heptose” (7 carbon) rings. Glucose is a hexose ring and is the most important energy source for the body, as it is a major nutrient for most cells. It can be found as both a straight chain and a ring. Though, the ring form is most common in the body. Glucose is low FODMAP when ingested on its own. Fructose and galactose are two additional monosaccharides commonly found in the diet. They are “isomers” of glucose. This means they have the same molecular formula (C6H12O6) but their atoms are arranged differently. Think of it like baking. All three compounds are made of eggs, flour, and milk, but the way they’re arranged will determine if they turn out like a scone, a cookie, or a cupcake. As with baking, the way molecules are arranged gives them different properties. Fructose is currently the only monosaccharide eliminated in the Low FODMAP Diet. In some IBS patients, the transportation mechanism that absorbs fructose from the intestine into the bloodstream can malfunction. Luckily, if glucose and fructose appear in equal amounts (like in table sugar – sucrose), fructose can hitch a ride with glucose. In this case, it’s absorbed through the glucose transporter instead of the fructose transporter. But when fructose is ingested on its own, or in an unequal amount (like in high fructose corn syrup), it can trigger symptoms in patients who malabsorb fructose. When two monosaccharides bond together, they create a disaccharide. This normally happens through a chemical reaction called “dehydration synthesis.” While it may sound fancy, all it means is that a water molecule has been removed and the two molecules have joined together to fill the empty spaces. Because these bonds were created by removing water, they can be broken down by putting it back. FODMAP solubility is important for digestion because disaccharides are too big to pass through the cell membrane of the intestine. Instead, disaccharides and other large compounds must be broken down by the body to be absorbed into the bloodstream. Any FODMAPs that aren’t absorbed in the small intestine will travel to the large intestine where they are fermented by your gut bacteria. Disaccharides in the diet include sucrose (glucose + fructose), lactose (glucose + galactose), and maltose (glucose + glucose). Lactose is the only disaccharide currently tested in the Low FODMAP Diet. Polysaccharides found in the Low FODMAP Diet include fructans and galactooligosaccharides (GOS). Because polysaccharides are larger compounds, it often takes longer for the body to break them down. This makes them an important energy source for the body but can also cause issues for IBS patients. Polyols are the final FODMAP group. This is the only group tested during the low FODMAP program that is not a carbohydrate. They are still sugars, but polyols belong to a different group called sugar alcohols. They are made of carbon, hydrogen, and oxygen and appear as long chains. That was a ton of information, so let’s take a second to summarise. FODMAPs are carbohydrate molecules made of carbon, hydrogen, and oxygen atoms. They can appear as one molecule (a monosaccharide), or be bonded together by dehydration synthesis to make pairs (disaccharides) or chains (polysaccharides). Because disaccharides and polysaccharides are bonded together by removing a water molecule, their bonds can be broken by reintroducing water, making FODMAPs water-soluble. This is important for digestion because disaccharides and polysaccharides are too big to be absorbed through the intestinal membrane. Their solubility means the body can break the bonds holding FODMAPs together so each molecule can be absorbed individually. Now you know how to make a FODMAP! Did you like this article? Sign up for my mailing list below. You’ll get new articles and recipes delivered right to your inbox. You can also follow me on Facebook for even more articles and research on IBS and the Low FODMAP program. Together we’ll get the Low FODMAP Diet down to a science! This article was edited by Melissa Morley M.Sc. Marieb, E. N. (2004). Human anatomy & physiology (6th ed.). San Francisco, CA: Pearson Benjamin Cummings. Martini, F., Ober, W. C., Nath, J. L., Bartholomew, E. F., Garrison, C. W., Welch, K., & Martini, F. (2011). Visual anatomy & physiology. Boston: Benjamin Cummings. Seeley, R. R., Stephens, T. D., & Tate, P. (2006). Anatomy & Physiology (7th ed.). Boston, Mass: McGraw-Hill Higher Education. Tortora, G. J., & Derrickson, B. (2012). Principles of anatomy & physiology (13th ed.). Hoboken, NJ: John Wiley & Sons.